Professionals dedicate hours each week to putting practice. Because putting can be the most repeated stroke in any given round of golf, you can really shave strokes off your score by practicing on the green. Take time to perfect the basics and add new ways of thinking about putting to improve your technique. You may be rewarded by taking three-putts out of your scoring for good. Establish a routine by picking up the ball, cleaning it, and setting it back down with the logo or name of the ball on the target line. Look at the hole, and take a practice swing to get a feel for how far back to take the club. Use a putting grip that will prevent your wrists from breaking on impact. 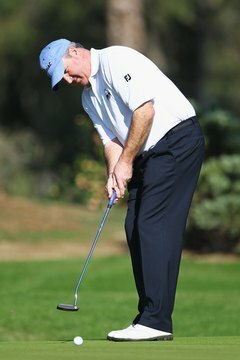 For the “reverse overlap” grip, put the putter head on the ground and place your bottom hand on the club with your thumb pointing straight down. Place the top hand on the grip, slide your hands together, and put your index finger over the little and ring fingers of your bottom hand. Step up to the ball so that it is positioned slightly in front of the center of your stance, and look at the hole again. Stand so that your eyes are over the ball, and feel balanced on your feet. Look at a dimple on the ball and line it up with a spot on your golf shirt. Do not move this spot as you putt; in other words, keep your body still. Resist the urge to peek before you finish the putt. Looking up will move your body and can take the putt off the target line.